‘Blog all about Tech ·Ed’ contest is back! Calling all bloggers, surfers, geeks, party animals, technology lovers and Tech ·Ed fanatics– be our eyes and ears now! We’d love you to start blogging everything about Tech ·Ed SEA 2008! What are you waiting for? Do what you do everyday. Twitch your fingers and blog about what you would like or do not like to see; who you would want or do not want to meet… There is no right or wrong answer. You can blog anything you like as long as it is related to Tech ·Ed SEA 2008! First 100 to blog about Tech ·Ed SEA 2008 will be entitled to redeem a Tech ·Ed SEA 2008 limited edition T-shirt. If your blog is found to be the most creative, outstanding and mind-blowing, you will be rewarded with wholesome prizes for your great effort. That’s not all, if you blog creatively and consistently, cool prizes are reserved for the best blogger of the month. One (1) of the five (5) monthly winners will stand a chance to be the ‘Super Tech ·Ed Blogger’!!! Closing date for the monthly judging will be the 15th day of every month at 11.59 P.M. Monthly winners will be notified by the 30th day of the same month. The situation is that you need to restore the Solaris Operating System on your client's server system disk for whatever reason, and I assume that you are unable to boot normally from the Solaris system. I also assume that you have a backup of your client's operating system on VERITAS NetBackup. You are going to boot your client up from CD-ROM or JumpStart, and use NFS to share the disk partitions out, then mount them on a NetBackup Media Server, and restore your operating system files into the Media Server mount point. This will effectively restore the operating system onto your client's system disk. Note that by default it is not possible to share partitions natively through NFS when booting from CD-ROM or JumpStart. You can choose either method to boot up, but in any case it is probably useful to follow the steps for preparing the OpenBoot PROM (OBP) environment. For the purposes of this document, the JumpStart server's IP is 10.0.0.1 and the client has an IP of 10.0.0.2, and a subnet mask of 255.255.255.0. The NetBackup Media Server's IP is 10.1.1.1. You can skip this step if you are booting from a CD-ROM. I assume here that if you boot from JumpStart, the server has a router address that allows your client to reach the NetBackup Media Server. If that is not the case, see the section on booting from a CD-ROM for the commands to set up routing: An Alternative Method to Boot Your Client From a Solaris Boot CD-ROM. Important note: You must share the NFS JumpStart files from the JumpStart server as read only, ( -o ro), or the JumpStart configuration will become corrupted. For more details, please see the SunSolve document SRDB ID: 22979 (editor's note: available to registered SunSolve users with a valid Sun Service Plan). To display any current aliases for network devices, use OK devalias. This lists the interfaces. Select the one you want (for example, b). At this stage you need to make sure your chosen interface will use the MAC that you got from the banner command. Use OK boot jump-nic -s or OK boot net -s, and wait for the # prompt. Use OK boot cdrom -s and wait for the # prompt. If you booted from a CD-ROM, on the client, run the commands necessary to configure the appropriate IP, netmask, and routing. If your media server is on a different network, add a route in (according to the following example). Here, 10.0.0.254 is the router that you can use to reach the media server, with the destination as the IP address of 10.1.1.1. I am assuming you have connected to your client through some sort of remote console, and it needs vt100 rather than sun as a terminal type. If your client is connected to a switch that is set to run at 100 Mbit/sec full duplex, you can change the duplex to be full, thus massively speeding up your restore time. If you have a more modern interface such as bge or ce, you will need to check the Sun documentation for the syntax to use. At this stage you should check that the subnet mask of your interface is correct. This is picked up from the subnet used for the same network range in /etc/netmasks on the JumpStart server. This command determines the broadcast for you and corrects it on the fly. Next, create and run a script similar to the one shown next. Modify the instance and dev name to suit your system. If you are using bge interfaces you will need to refer to other documentation, as a different syntax is used. You are going to make the /etc/dfs directory writable so that you can use NFS on the client to share out the disk partitions. Note that in this case it is READ / WRITE ( -o rw ), as you want to use NFS to share the disk partition to which you are going to restore. Now that the dfs directory is mounted in the writeable swap file system (/tmp on your client), dfstab and sharetab are writeable files. This allows you to share disk partitions from your client using NFS, even though the directory is read only by default when the client is booted from CD-ROM or JumpStart. Note: The boot directory on the JumpStart server is actually / (root) on your client. The next step is very important. You will determine the real disk name of the root disk to which you are restoring. Important note: If you are restoring a system with multiple disk controllers, when you boot from JumpStart or a CD-ROM, the controllers will almost certainly be probed in a different order than they would be probed when booting normally from UNIX. As a result, the controller names will be different. For example, c2t0d0, when booted from JumpStart, could refer to c1t0d0 booted from UNIX. To get the real device name, you need to issue the devalias command from the OK prompt. This will display the hardware path of the boot device and you can compare it to the output of the format command. 1. While booted from JumpStart, issue the appropriate break signal (stop+A, or the equivalent, according to your connection type) to go to the ok prompt. 4. Under JumpStart, the root disk you need to restore to is c2t0d0. Now use the format program to reformat your disk using the same partition sizes as the original system had, or use suitable alternative sizes. Also, note that if you had your root disk mirrored under VERITAS Volume Manager, and you are restoring to the original system disk, due to the way VERITAS repartitions the disk, you will definitely have to reformat the original disk and reinstate VERITAS mirroring later on. When you have reformatted the disk, create file systems on it. Now log on to the VERITAS NetBackup Media Server as root, and mount the client's NFS share on it. Check that you can see a lost+found directory to confirm that you have actually mounted the remote share. Very important note: On all versions of the VERITAS NetBackup software, when you are restoring files there will be an option to rename hard and soft links. You must select rename hard links and deselect rename soft links. If you get these options wrong, you will lose absolute path symbolic links and your restore will be invalid. Note: Using start, run, cmd, and typing ipconfig will display your machine's IP. If you are restoring from VERITAS NetBackup version 3.4, I suggest using the xnb interface to run your commands. However, the following example is for VERITAS NetBackup 4.5. Please note that if you are using VERITAS NetBackup 3.4, you need to make selections that will achieve equivalent results to the example I have given for version 4.5. Log in to the GUI as root and enter the root password when prompted. In the left pane, click backup restore and archive. Then, in the right pane, select the restore tab and click on the hand symbol, located at the top right side of the window. On the source client tab, do the same to select the name of the client backup that you are going to restore, click add, type in the client name, highlight it, and select make current. On the destination tab, repeat the previous steps to select the media server where you have mounted the NFS share of the client's root file system. Click okay to exit back to the previous window. On the far right of the browse directory there are some icons. Hover the mouse over the icons to see their names, if needed. You will probably only need to click the icon for show most recent backups. Click the refresh icon to display your results. This should list all the files from the most recent full (and possibly differential) backup for your client. 2. Now click the restore button at the bottom right side of the display. Select restore to a different location. If needed, type / as the source directory. (In later steps this would be /var or /home.) In the destination directory, type in your mount point on the media server, for example, /tmp/client_1. Note that when restoring /var, the source directory would be /var and the destination directory will remain /tmp/client_1. Very important note: As stated previously, on all versions of the VERITAS NetBackup software, when you are restoring files there will be an option to rename hard and soft links. You must select rename hard links and deselect rename soft links. If you get these options wrong, you will lose absolute path symbolic links and your restore will be invalid. 3. Now select restore directories without crossing mount points and make sure that overwrite existing files has not been selected. 4. Click start restore and select yes to view progress. When the restore is finished, unmount the file system on the media server. Work through the "Select the Files and Restore Them" section again. Work through the "Unmount and Unshare File Systems to Prepare for the Next Cycle" section again. Repeat this process for the appropriate slices until you have restored all the file systems required. After all restores are completed, make the disk bootable. After the process is completed, you need to install the boot block to make the disk bootable. To do so, mount slice 0 onto /tmp/disk again. While the root partition is still mounted, before rebooting the client you need to disable the disk mirroring (such as mirroring with Solstice DiskSuite software). However, the following example is for unmirroring a disk mirrored with VERITAS Volume Manager. Consult your Sun documentation if your disk was mirrored with Solstice DiskSuite. Note: It is assumed that you have laid out your disk partitions for the restore in the same way they were laid out when the system was originally built. If this is not the case, edit the file and adjust any mount points as needed. Unmount all disk slices and run fsck -y on them to ensure the sanity of the file systems. Shut down the client and boot up. After booting up from your successfully restored system, reinstate the disk mirroring as appropriate, and carry out any other work as necessary, such as copying additional mount entries to /etc/vfstab from the original vfstab.vx file. Brad Webb is a contractor based in the U.K., with 16 years of experience in the IT industry. He currently works as a Solaris and UNIX Systems Administrator, and in the past has worked for various companies in permanent roles, including UNIX Systems Administrator, Hardware Analyst, and Field Service Engineer. Selepas beberapa saat, si isteri bersuara lagi, 'Kemudian tu kan.... abang selalu gigit-gigit leher saya...' Dengan perasaan marah dan geram, si suami melontar selimutnya dan bangun dari katil tu. Si isteri heran dan terus bertanya, 'Abang nak gi mana tu?' 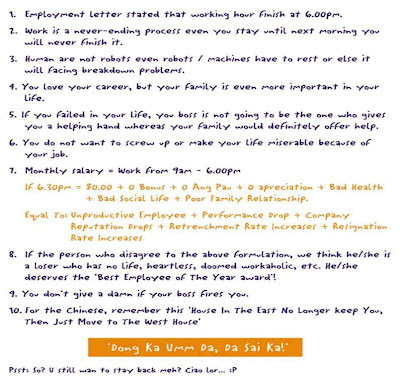 Dengan nada marah suaminya menjawab, 'Nak gi amik gigi la ni...' "
I found this on my notes folder, compile by my former colleague during the day when we support SUN Servers. Symptom: Error message at boot time if databases are <= 50% of total database. System comes into single-user mode. 1. At the ok prompt, issue the boot command. The system will enter single-user mode because of the broken database replicas. Ignore any "Read-only file system" error messages. 2. Use the metadb command to look at the metadevice state database. You can see which state database replicas are not available -- they are marked by "unknown" and the M flag. metadb: demo: /etc/opt/SUNWmd/mddb.cf.new: Read-only file system. 5. Use the metadb command to add back the state database replicas and verify that these replicas are correct. 1. Replace the faulty disk. 2. Create a partition that is the same as the original disk. If you need to recover the state database, follow the above steps. Invoke: "metareplace d0 /dev/dsk/c0t3d0s0 "
Untuk rekod, angkasawan pertama Malaysia ialah seorang rakyat Terengganu yang berasal dari Besut iaitu Ayah Pin. Figura 1: "Gua orang first! 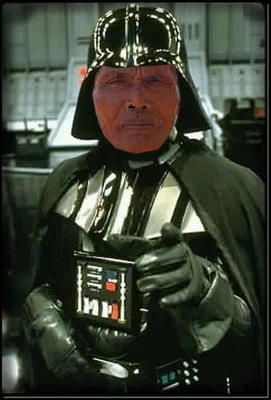 ", kata Ayah Pin dalam costume DarthVader semasa lawatan ke set penggambaran filem terkenal arahan George Lucas di Hollywood ketika diminta mengulas. P/S:Komentar dari Dr. Sheikh kepada Kerajaan supaya menghentikan dahulu penghantaran Dr. Faiz sebagai Pelancong Angkasawan ke-2 selepas beliau kerana merasakan kerajaan perlu menanggung kos yang amat tunggi. 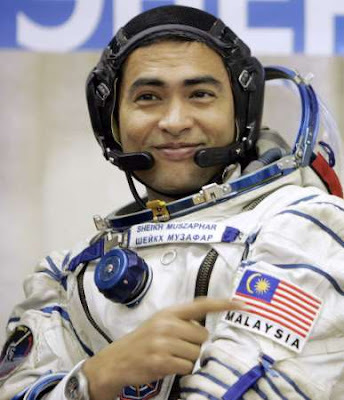 STS-MC (Space Tourism Society Malaysian Chapter – Persatuan Pelancongan Angkasa Cawangan Malaysia) amat gembira dengan perkembangan terbaru yang mana Muszaffar mengakui bahawa program angkasawan adalah terlalu mahal dan tidak berbaloi iaitu melebih USD100 Juta. Sedangkan kalau kerajaan membuat RND untuk menyediakan sebuah kapal terbang angkasa lepas ke ruang angkasa ianya tidak melebihi USD80 Juta. Dan kapal angkasa tersebut boleh terbang melebihi 100KM dari muka bumi ini. Dan tahukan anda, mana-mana Juruterbang yang membawa kapal mereka melebihi 80KM dari muka bumi boleh diisytiharkan sebagai angkasawan? Hah, kalau kerajaan RND dan bina kapal angkasa ni, sudah tentu Malaysia boleh menjadi pelopor kepada PELANCONGAN ANGKASA. Sudah tentu banyak orang-orang kaya yg tak tahu duit nak campak ke mana akan jadi pembeli tiket ke angkasa ini. 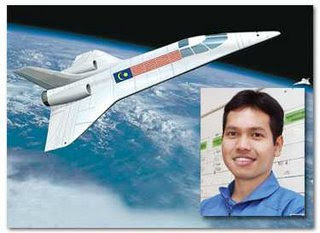 Seorang charge USD50 Juta, kalau satu space shuttle boleh muat 5 orang, setahun buat 4 kali penerbangan cukuplah, boleh untung balik. Gua ni business minded beb!! hahhaha. Figura 2: Bakal angkasawan seterusnya (gambar petak), kalau takda aral melintang bersama jet angkasa yang akan membawa beliau. But i do agree that this angkasawan programme really boost up budak-budak kat skolah untuk lebih meminati sains terutamanya sains astronomy. Kerana mereka sekarang sudah mempunya idola iaitu angkasawan. Aku sendiri tgk anak-anak buah aku bukan main sronot tgk kapal angkasa sekarang, itu hari masa Dr Sheikh datang ke TTI, K. Terengganu siap heret ibu diorang pergi nak tgk sheikh muzaffar. Sekarang, ibu-ibu kat Malaysia ada tagline baru dah nak suruh anak dia rajin belajar, "Nak jadi macam sheikh muzaffar tak?" baca buku Sains tu, siapkan kerja rumah math yg cikgu bagi tu cepat. Tapi yang lagi parah, lepas ada angkasawan ni siri popular ULTRAMAN pun main glamer hahahhaha. Nabil, wa pinjam lu punya kata hikmat-LU PIKIR LA SENDIRI!!! This month, four eagerly awaited cameras all hit the market with a big ole thud: Canon's EOS Digital Rebel XSi, Sony's Alpha a350, Nikon's D60 and Olympus' E-420. They are not all evenly matched on paper, as you will see, and they certainly vary in price. But what's different about them, really? They are all aimed at people who wake up one morning and realize their point-and-shoot's pics are pretty crappy, people who don't consider themselves photographers but wouldn't mind spending a little money (under $1,000) to put those high-school photography lessons to practice with a decent body-and-lens kit. I decided to fiddle around with the four hottest new entry-level DSLRs and see what I could see. The Weigh In As you can see, there's a wide range. I'm not saying weight is everything, but being the heaviest (by a lot) doesn't help the Sony. On Paper Before we get into each camera's capabilities, have a look at their specs. Cameras are arranged in order of price, from cheap to pricey. You can see how it's easy to fall in love with the lower-priced models. But in action, you statt to realize why the pricing is so slanted. Note the Nikon's shot: The cat is squinting because of the auto-focus lamp that goes on before the shot—generally annoying when trying to capture kids and pets in their natural states. What I Liked It's an all around decent camera, much lighter in weight than the Sony but with most of the same performance. The cheap starter lens, which you may scoff at, gives it an added weight bonus, making it lighter than all but the Olympus. What I Didn't Like Live View is limited, or you might even say crippled. You can't preview autofocus—I'm not even sure the autofocus works very well in this mode. In the manual, Canon concedes that this is really for still life shooting and other limited applications. Also, for being $150 to $170 more than the Nikon, it's more or less the same class of camera, especially for manual shooting. What I Liked All around intuitive camera with impressive automatic modes, a Live View that can demonstrate a lot, and solid control for people who know more. It's got the teaching ability of the Olympus with the picture reliability of the Canon. Although the a350 with 14-megapixel sensor is not as good a buy as the Canon at the same price, I think the nearly identical $700 a300 kit might be the best value of all right now. What I Didn't Like The thing is giant, especially with the 16-80mm lens I tested. (The a300 is the same size and weight, by the way.) In Live View, I noticed from time to time that white balance on preview was different than what came out in the shot, which was annoying. The worst attribute, though, is the exceptional processing delay after you take each shot. What I Liked There's a keep-it-simple design here that works: not many hidden frills, but many nice clear options. I think for the money, this is the best idea for knowledgable, confident shooters, though it's not the best bet for beginners. I like one rare random perk in particular, the stop-motion video maker. What I Didn't Like Simple means no frills like Live View previewing that the other models have. Though it's very handy when done right, like on the Olympus, it can also be done badly. Judging from Canon's execution, I can see why Nikon didn't bother. I have two particular pet peeves with the Nikon: Low-light autofocus triggers a very bright AF lamp, which makes pets and children go all squinty, and the auto white balance makes things too yellow indoors, and can't be overridden when in automatic modes. What I Liked Besides the remarkably low price, I think this camera has the capacity to teach you a lot about manual settings because of the Live View. Like the Sony, this shows you the effects of your WB, exposure, f-stop and shutter settings in a live preview as you make them. Oly has this down, and was the one tat started it all. What I Didn't Like The lightweight camera is missing a lot of strong tech: the ISO 1600 is noisy, autofocus doesn't respond nearly quick enough, and shooting in automatic modes turns up blurry and unfortunate shots. There you have it, folks. I've tried to include enough of my methodology to let you judge this stuff for yourselves. Surely there's a lot to talk about, including the obligatory "body vs. glass" debate. I agree that lenses make a difference, but with new DSLR advancements, the bodies are starting to have a greater impact on how well people take pictures. You may know it all, but any one of these cameras can help the ignorant noob more than anything that came before. OK, that's my take... you have the floor. It's a question I get nearly every day: "I want to step up from a point-and-shoot camera to a digital SLR; should I buy a Canon (CAJ) or a Nikon?" Glad you asked. The answer just got more complicated thanks to Sony's (SNE) new $799 Alpha A300. This is one terrific alternative, perfect for soccer moms and baseball dads who want to stop action of their kids and get closer to the scene. Single-lens reflex (SLR) models are the fastest-growing segment of the digital camera market as point-and-shooters look to improve their photography with the same kind of camera that professionals use. All are excellent cameras, but the balance is tipped toward Sony for features that will appeal to average shutterbugs lusting after sharper photos. The A300 (and the A350, which has a higher megapixel count) has built-in image stabilization (in-camera tools to help steady your hands) and the best focusing I've seen on a digital SLR. Sony calls it "predictive" autofocus. We've all held the shutter button down halfway to focus, on both point-and-shoots and SLRs. On the A300 and A350, you just point the camera at your subject, and it does the work for you. I tested this feature on a recent trip to Washington, D.C. While a friend drove around, I stuck my head out the car window and quickly took pictures of randomly shifting images. Most were amazingly sharp. Then there's Live View. If you like using the preview LCD screen on your point-and-shoot — to say, hold it above a crowd to grab a shot — the A300 is for you. Most SLRs don't let you compose on the LCD; you have to use the viewfinder. The A300 lets you do it via the viewfinder or the LCD screen, which tilts up and down. To access Live View, you simply click a button on top of the camera. Canon's new Rebel XSi also has Live View, but using it is more complicated. You have to go into the camera's menu, and through a bunch of steps, and focusing isn't as seamless as with the Sony. The drawback to the Sony cameras are accessories and lenses. Shutterbugs look to SLRs to bring them a variety of different views — ultraclose-ups and wide angles made possible with different lenses. Canon and Nikon offer more than 50 lenses each and hundreds of accessories. 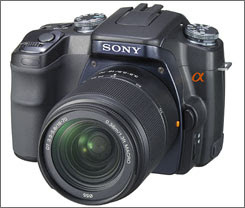 When Sony introduced the Alpha in 2006, it had 19 lens available; two years later, the number has increased to just 24. Most Sony lenses are pricier than — or not as good in low light as — comparable Canon and Nikon lenses. Most shoppers agonize over the Canon vs. Nikon decision, but there is no right or wrong answer. It comes down to personal choice: how the camera feels in your hands. Both Canon and Nikon have made top cameras for decades, and that hasn't changed in the digital age. Canon's Rebel XSi is a major upgrade from the XTi. It has a smaller body, large LCD screen, Live View, improved manual controls and better resolution. Nikon's D40 is the choice for many first-time digital SLR buyers, because of its sweet $499 price. The drawback: It has a 6-megapixel sensor (a megapixel is a measurement of a camera's resolution) compared with 10 for Nikon's new D60 and the Sony A300, and 12 for the Rebel XSi. Both the D40 and D60 can autofocus only with digital-era Nikon lenses. Older lenses can be used, but they must be manually focused. For first-time Nikon buyers, the D40 is the more logical and economical choice over the D60, unless you plan on cropping a lot and making superlarge blow-ups. Canon Rebel XSi vs. Nikon D40 or D60? I opt for the Rebel, for the 3-inch screen (Nikon's is 2.5 inches) and extra megapixels. Overall, though, I'd give the nod to Sony's Alpha A300 for any first-time SLR buyers, as long as they don't need a lot of lenses. The consistent focus makes it a really sharp choice. I have found this cool website providing cool free templates for blogger and wordpress. Feel free to go to their websites (see link at the footer below my blog). The Hard Truth About Soft Skills, only 25% success in job depends on technical knowledge! In business, we often hear HR-types refer to "soft skills." Since "soft" has a light-weight, somewhat warm and fuzzy connotation, these abilities are often considered unimportant, or, at most, secondary to the "hard" skills—technical ability and factual knowledge—needed to get the job done. But professional trainer Peggy Klaus is here to tell us that it's time to pay soft skills their props, because these are the core competencies that can make or break your career. In her new book The Hard Truth About Soft Skills—Workplace Lessons Smart People Wish They'd Learned Sooner (Collins, 2008), Klaus presents 54 workplace lessons based on her years of training, coaching, and interviewing people at all levels. What she found is that people aren't getting where they want to go in their careers. She writes, "Whether young or old, experienced or inexperienced, what struck me most about their stories of missed opportunities and derailed careers was this: Their problems rarely stemmed from a shortfall in technical or professional expertise, but rather from a shortcoming in the soft skills arena with their personal, social, communication and self-management behaviors." • A survey conducted by the Graduate Management Admission Council found that although MBA's were strong in analytical aptitude, quantitative expertise, and information-gathering ability, they were sorely lacking in other critical areas that employers find equally attractive: strategic thinking, written and oral communication, leadership, and adaptability. § Remain silent until the other person has finished. After she stops, ask for clarification with a question like, "Let me be sure that I understand what you're saying." Then paraphrase her words to see if you've gotten it right. § Be curious instead of defensive. Eagerly and excitedly, ask the other person to add more specifics so you can truly understand what she means. § Use both nonverbal and verbal cues to convey understanding and empathy, such as nodding your head in agreement saying things like, "I understand how you could feel that way," or "Please, tell me more." Klaus concludes: "Mastering soft skills takes persistence. It requires that you be mindful about yourself and your career. It demands that you look honestly and critically at your behavior, as well as genuinely being open to feedback—whether good or bad. Mastering these practical and tactical skills doesn't magically happen overnight. It requires hard work, but the payoff can be tremendous…Whether you are an extroverted marketing person or an introverted engineer, mastering the soft skills will serve you well." If Klaus's findings inspire you to spiff up your own soft skills, you can take an online automated self-assessment quiz at www.peggyklaus.com that allows you to respond to 24 items and receive instant feedback on which soft skills areas you need to improve, along with customized advice from Klaus. Shari Lifland manages content for AMA's Members-only Website, edits several AMA e-Newsletters, and is associate editor of MWorld.